The new Techsit brochure is now available for our UK manufactured range of Technical Work Seating designed for use in Laboratories, ESD/Static Safe Areas, Clean Room Environments and all Production facilities. Designed to be tough, durable and comfortable, with a 5 year guarantee and 150kg capacity our modular seating provides the perfect chair for any work environment. Click on the image above to see the full range. Techsit is once again exhibiting at the Mach 18 exhibition at the NEC Birmingham. 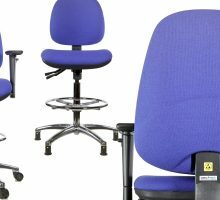 Along with Werksitz we are launching the new Werkstar range of Technical Work Seating. Our new PU chairs, sit-stands and stools are designed for those tough environments, are easy to clean but still offer all the ergonomic qualities of our upholstered seating and come with a 5 year guarantee and 150kg weight capacity. We can also do ESD PU!! So for our new 2017 catalogue please click the image below to download. You know you need something different to an office chair when…. It’s all Greek to you! ESD, static safe, airborne particle count, clean room classification; are we speaking a different language? If it is all Greek to you ( or make that Chinese if your Greek is fluent!) then Techsit can help translate those potential orders. Now and again your customers will require a more technical spec for the seating in their production / lab / G.M.P etc environments. A spec that isn’t met by the office chairs that are suitable for, well, their office environments. Techsit specialises in technical work seating from G.M.P clean rooms through to Aerospace production and all in between. So what is the working environment? laboratory or medical facilities – you probably need anti-microbial and bleach cleanable finish. Lab benches tend to be higher than desks so a high chair is also likely, glides or brake-loaded castors? clean room manufacturing or research – what classification of clean room is it; 3,5 or 7? Roughly translated the lower the class the lower the allowable level of particulates/m³ of air and the right, or wrong, chair quickly contributes to the levels achieved. G.M.P manufacturing – may require clean room standard seating plus covered mechs and easily cleanable finish. static-sensitive production – will require ESD and anti-static seating. The static charge produced by the average human can easily blow any micro-chip circuitry which is not a good thing when producing, for example, aeronautical components or weapons guidance systems! Electro-static-dispersive seating neutralises this risk within a static safe environment. tough production environments – use PU for robust durability combines with comfort. Plus of course die-cast aluminium bases and quality gas lifts to take the beating these chairs may take on multi-shift production sites. Sit-stand or stool for ease of operator movement? wet room environments – you will need stainless steel not chrome to cope with the cleaning routine! 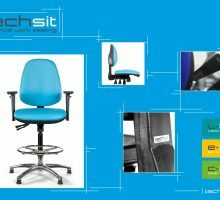 Reading this article you would expect that Techsit seating provides the technical specs to fulfil the above criteria, but, what you might not expect, it also provides what you would want from a quality office chair: ergonomic design, adjustabilty, comfort, excellent build standard. 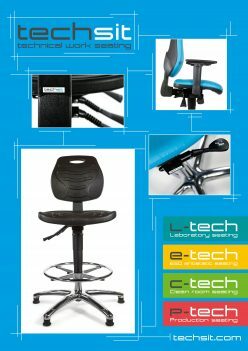 Techsit seating is created on a modular concept so that the chairs are tailored for individual and environment best fit. 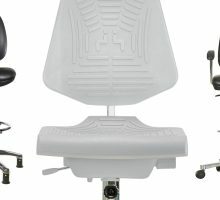 You will certainly recognise the language of synchro-mechs / auto-weight tension-able / brake-loaded / 3-D adjustable etc etc that still applies as much to our technical seating as your office chairs! Techsit present to cleanroom industry at Connect 2 Cleanroom open day. Dr Strange Film uses Techsit Laboratory Seating. 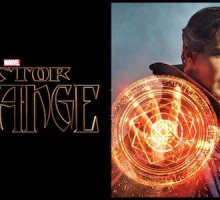 Techsit along with distributor Spectrum Healthcare supplied Laboratory seating for the Hospital scenes of the latest Marvel Comics Blockbuster Dr Strange filmed in the UK last year. The chairs used in a number of scenes both in the operating theatres and the hospital laboratories. To see them for yourself visit our Laboratory Seating pages. Made in Great Britain with Great looks, Great comfort, Great Quality and a Great 5 year guarantee…. Now did you expect that? Yes..not only is the Techsit range of ESD seating manufactured in the UK to a fabulous standard of quality and comfort, looks fab the product also comes with a full 5 year guarantee, including the fabric, you can`t say fairer than that! 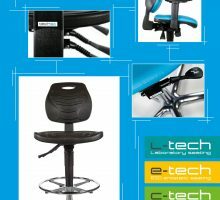 l-tech – New lab seating from Techsit. This is what you’ve all have been asking for…. 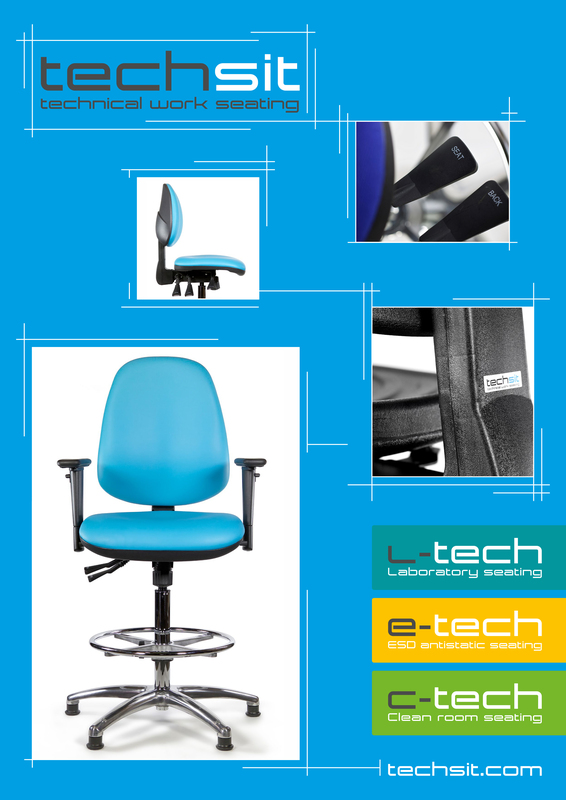 Techsit launches its own range of excellent quality ESD/ anti-static seating – E-Tech. We`ve created it based on our usual principles of quality, comfort and value for money. We are always scouting out niche new products to fix the issues that people are having with their workspaces. Recently we were introduced to the Kiga chair, a revolutionary chair that is perfect for infant school teachers. This role in particular calls for a lot of crouching down to the level of the children, or in some cases sitting on child sized furniture. Sitting this low, causes the knees to come above the hip and create an unnatural slump, or curvature of the spine; synonymous with causing back pain. The Kiga chair is designed especially to those who work at a lower than desk height level with its shorter gas stem and supportive chest plate to lean against. This chair can be used either way round to either use as a support or a normal chair to sit at your desk comfortably. Curious to see how this chair worked in practise, we decided to try it out in a local school and get some feedback from the teachers themselves! What was wrong with the previous set up? It was a very low traditional ‘old skool’ upholstered teacher’s chair. Not suitable to work at the computer on my desk or portable to the tables were the children are learning. What are the benefits of your new set up vs. your old set up? The Kiga chair has completely revolutionised my teaching practise. The fact that I can adjust the height of the chair to suit my very different working needs is fantastic. I can now work at the computer comfortably or lower the chair to fit the small tables when I am teaching alongside the children in my class. I had a real problem bending over the tables to teach individual children but due to the genius of the Kiga chair’s reversible back rest I can lean forward to support my back. The difference it has made is amazing. The specific localised pain I was experiencing has disappeared and this largely due to the fact that I can straddle the chair and lean forward comfortably. This means that my back is in alignment and not being compromised. Thank you so much. What would you like to change about the Kiga chair? Would you recommend the Kiga chair to a friend?